This is a national competition providing an opportunity for students to work on a real business challenge. The competition runs until mid-June and the first prize is a once in a lifetime trip to India. 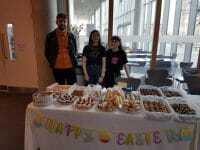 To find out more students are invited to a workshop on Monday 24th February from 12:30 – 2 p.m. at the Springburn campus – a free lunch is provided. If you are coming along then email pantstopoverty@www.glasgowkelvin.ac.uk by 19th February. The 2014 theme revolves around progress on human and labour rights in the fashion industry and will support the Fashion Revolution Day longstanding campaign. We have come a very long way since Nelson Mandela stood in Trafalgar Square in 2005 and called for a generation to rise up and Make Poverty History. His words and the enormous need for change inspired the Pants to Poverty brand as part of the global campaign …………….this is an invitation to be part of that campaign! Do you have what it takes to win the PantrepreneurSHIP Challenge? The College’s Youth Access programme supports young people aged 12-17 from the North East of Glasgow in youth club settings to develop an early relationship with lifelong learning. They learn, based on their own interests, transferable ICT skills through creative hardware and software. Their learning is recognised through a variety of youth work awards, benchmarked College certificates, SQA units and arts awards. The young people also gain the key social skills required for effective communication with peers and with adults. The programme is led by college youth workers and further support is provided by partner youth workers in community settings. A typical week will involve 26 sessions in 15 different venues, with average attendances of over 20 young people at each. A variety of partnership arrangements are in place at each of the different venues. The North East area of Glasgow witnesses significantly high levels of deprivation and social exclusion. Therefore the Youth Access programme widens access to the opportunities which relevant skills and qualifications can provide. 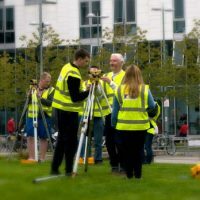 The College felt it was essential that young people have the opportunity to progress to further learning and gain the skills needed by employers. In fact, almost 30% of them ultimately progress to full-time College programmes. [quote] Glasgow Kelvin College is truly proud that its work to ensure young people remain engaged positively with education has been recognised in such a prestigious way and we are very pleased indeed to receive this UK-national accolade. We are very grateful to the Association of Colleges and to the University of Southampton for recognising the importance of the programme in helping young people to remain engaged with learning, in spite of any other challenges they may face in their lives. ‘Youth Access’ is a key route to accessing learning for local young people, guiding them towards the skills and qualifications they will need in the jobs market. The Award is also a tribute to the hard work of our partners who have supported this innovative programme. Staff and students at Glasgow Kelvin College celebrate winning a coveted “Further Education Oscar” for its Youth Access programme. Staff and students were celebrating today at the news that Glasgow Kelvin College has been awarded the prestigious Association of Colleges (AoC) Beacon Award for 14-19 Widening Participation. 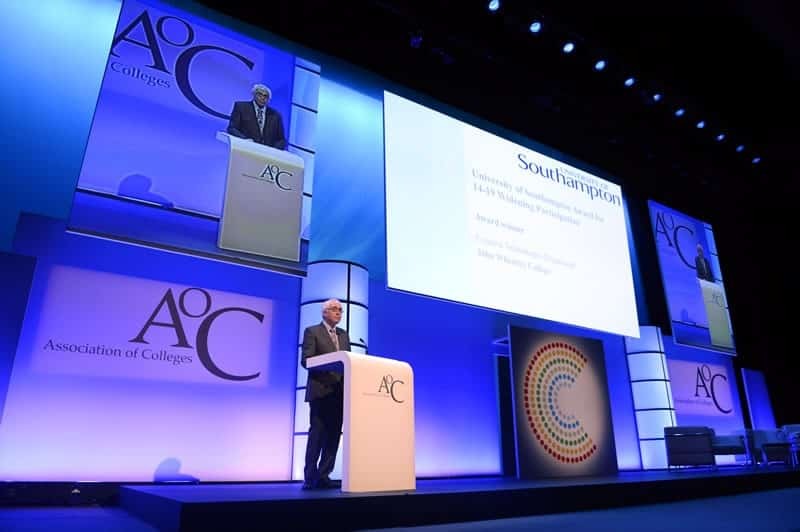 The college was announced as winner of the award, sponsored by the University of Southampton, by Lord Willis of Knaresborough, President of the AoC Charitable Trust, at the AoC Annual Conference in Birmingham on Wednesday 20 November. Lord Willis of Knaresborough, President of the AoC Charitable Trust, announcing the winners of the AoC Beacon Awards: Glasgow Kelvin College, for its Youth Access programme, which in partnership with a number of community organisations offers a large youth access programme for 12-19 year olds. 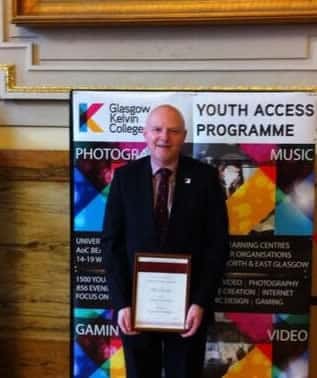 Glasgow Kelvin, previously John Wheatley, College won the award for its Youth Access programme which brings together a number of community partners with the College to offer a large youth access programme for 12-19 year olds, operating across several centres. The programme covers challenging 12-19 year olds and has been highly successful in introducing ‘learning by stealth’ – slowly raising aspirations by targeting and working with the youngster’s own interests and then expanding their horizons and introducing them to new learning experiences. 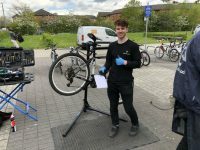 The programme has a clear record of success over 10 years, building relationships, expanding provision and getting a greater number of young people to achieve formal qualifications. [quote]We are delighted and honoured to receive this award and thank AoC and University of Southampton for this recognition. Our Youth Access programme is a unique and prime example of the College’s drive to widen access and, through partnership, bring disengaged young people into a creative and stimulating learning environment. Added to useful IT skills, they also learn the skills for life and work, in line with the Scottish Government’s Curriculum for Excellence agenda. As the Chair of the National Steering Group it has been a really interesting and exciting experience being involved in the selection of the AoC Beacon Award winners once again. The field this year was as strong as ever. It’s great to see colleges identifying the challenges that we face, and confronting them head-on in innovative and creative ways. The winning entries this year are all fantastic examples of the ways in which colleges are demonstrating how thoroughly they understand and respond to the needs of their learners, wider communities and employers. I should like to congratulate all of the successful colleges and hope that they can make the most of the opportunity afforded to them through the Beacon Awards to help stimulate innovation and curriculum development across the sector. 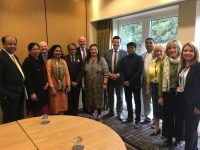 I have been greatly impressed by the innovative and excellent initiatives which have been identified through the assessment process of the AoC Beacon Awards this year. It is a privilege to be able to see, first hand, the many imaginative and creative approaches that colleges are adopting to support their learners. The dedication and passion shown by these winning colleges to ensure that individuals are given the opportunity to realise their full potential is inspirational and I hope that the wider sector will benefit as a result of celebrating their achievements. Glasgow Kelvin College will host a local celebration event in the New Year and will be presented with its Award by Matthew Hancock MP, Minister for Skills and Enterprise, at a national presentation ceremony due to be held at Westminster on 5 February 2014. Glasgow Kelvin College was vested on 1st November 2013 from the merger of Stow College, North Glasgow College and John Wheatley College in Glasgow. 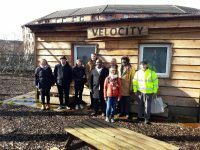 (The award recognises the Youth Access programme set up by John Wheatley College in Easterhouse and Glasgow’s East End.) The College expects to deliver a wide range of learning programmes to some 14,000 students in 2013-14. Currently around 50% of Glasgow Kelvin College’s students reside in the 15% most deprived postcodes in Scotland. To help address this, a broad portfolio of vocational and core skills programmes is delivered, from introductory and access through to degree level learning. The AoC Beacon Awards highlight the breadth and quality of education in Colleges throughout the UK and increase understanding of Colleges’ contribution to UK educational skills policy and economic and social development. The AoC Beacon Awards are now in their 20th year and are awarded to UK colleges who capture and celebrate the positive impact they have on their students, staff and communities. The Awards are administered by the AoC Charitable Trust which was established to advance the education of members of the public over the age of 16 years. The University of Southampton is a leading UK teaching and research institution with a global reputation for leading-edge research and scholarship across a wide range of subjects in engineering, science, social sciences, health and humanities. With over 22,000 students, around 5,000 staff, and an annual turnover well in excess of £400 million, the University of Southampton is recognised as one of the country’s leading comprehensive research institutions. We combine academic excellence with an innovative and entrepreneurial approach to research, supporting a culture that engages and challenges students and staff in their pursuit of learning. Margaret Curran MP, Shadow Secretary of State for Scotland, last week opened the state-of-the-art Wheatley Digital Innovation Lab at the Glasgow Kelvin College Easterhouse campus. The brand new learning centre, funded by The Wheatley Group, boasts not only 16 cutting-edge PCs and software but also an amazing 3D printer which is the very latest in product development. The Wheatley Digital Innovation Lab is available to young people on the College’s Youth Access programme, community learners and college students who are welcome to come in and see the equipment in action and learn how to make best use of it. Learning is delivered from introductory level right up to advanced level. The Wheatley Group are keen to ensure that communities have access to IT resources and skills to open up opportunities and help learners progress into skilled technology-based jobs and by expanding their partnership with Glasgow Kelvin College they are assured that their investment will hit the target. 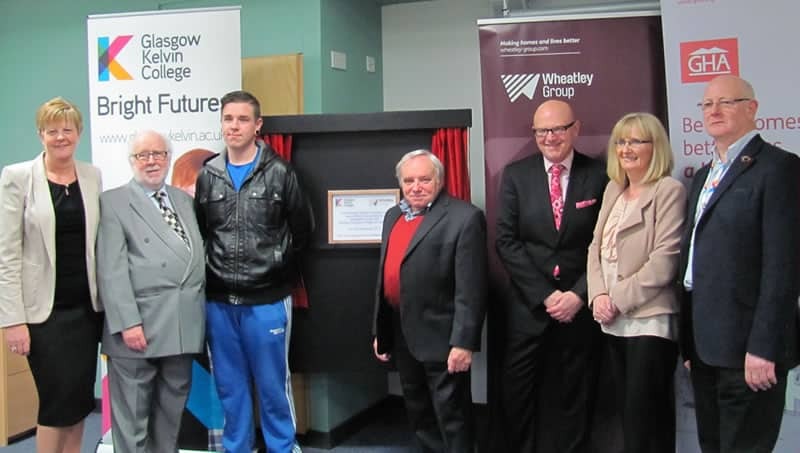 Official opening of the Wheatley Digital Innovation Lab established in Glasgow Kelvin College’s Easterhouse Campus. All of the partners here today share the same goals – to boost the number of people who can get online access in Glasgow and to help young people achieve the most in life. Today’s project is part of a wider partnership and we are already seeing the benefits of the 23 learning centres set up with the college in GHA communities which are helping tenants get free internet access. Wheatley Housing Group is delighted to be part of this project and to fund the 16 computers for the digital lab. We hope this facility will encourage more students at the college to go on to further education, and there are also wider benefits for the local community who will also be able to use these computers. I was delighted to be able to perform the official opening of this project. I am always keen to see investment and resources in the East End of Glasgow to match the wealth of talent and ambition our students already have. On Wednesday the 27th of November the Princes Trust held their annual Celebrate Success awards. The top award of the night, the Samsung Young Achiever of the Year Award, saw one of our Get Into Security students, Ayden MacMillan as a finalist. Aged just 17, Aydan’s life was turned upside down – his mum died and he was left grieving, to fend for himself. With Prince’s Trust support, Aydan is now in full-time work, paying his own way and on the path to achieving his life-long dream of becoming a policeman. Aydan was a runner-up for the award and we would like to offer him our sincere Congratulations. 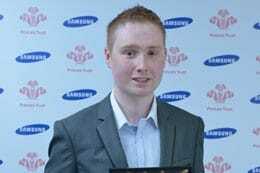 Aydan’s story can be found on The Prince’s Trust website. Last year’s winner of the Samsung Young Achiever of the Year award was also a Get Into Security student of ours, that’s the second year running that one of our students has placed in the running for the top award.